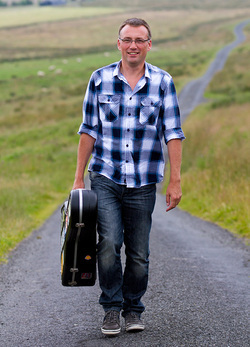 Guitarist and singer Simon Haworth started his folk music career performing with his father, Terry, at venues and folk clubs across Cumbria, appearing regularly at Whitehaven Folk Club and Keswick Folk Club. After a degree at Newcastle University in Surveying Science, and a brief stint working for British Coal, Simon started to play full time with appearances alongside Alistair Anderson, Nancy Kerr, Kathyrn Tickell, Amanda Lewis & Julian Sutton, Rachel Unthank and Irish step dance team, Clann Na Gael. He teamed up with Irish fiddler and BBC Radio 2 Young Tradition Award winner Carlene Anglim in 1993 / 4 and they appeared together on the first Evolving Tradition album. He worked with folk starlet Bill Jones on her debut album, long serving Fellside artist Bram Taylor on two of his albums, toured with fiddle and Northumbrian Pipes duo Tom McConville & Pauline Cato, before teaming up with celebrated singer-songwriter Jez Lowe. He played bass for 6 years with Jez Lowe & the Bad Pennies, touring regularly across the USA, Canada, Europe and Australia, and appeared on two album's, Honesty Box and Live at the Davy Lamp. He also appeared at the Kennedy Centre in Washington DC with Jez and the video can be viewed here. During his time with the Bad Pennies, he met and formed a very successful duo with champion Northumbrian Piper, Andy May. They worked on two albums together (one solo album each). Andy subsequently went on to join the Bad Pennies. Both Simon and Andy were invited to play at the arrival of the new Millennium Bridge across the River Tyne, and at the World Premiere of the Peter Jackson film, Lord of the Rings. Acclaim for his second album, Taking Routes, was universal with Living Tradition calling it..."a collection of material here that marks him out as a gifted writer, capable of penning the charming as well the powerful and majestic and there's no better flagship for literate, passionate erm, "Britfolk" than this fully realised album. One of the year's finest releases so far and warmly recommended". One of Simon's songs, Rory's Still, was recorded by Scottish singer Robin Laing on his One for the Road album, whilst others, particularly Turn to the Sea and The Lookout, are being sung in folk clubs up and down the land. Formed over 15 years ago, Simon continues to play with popular Northumbrian ceilidh band, Real to Reel. Over the years Real to Reel have played at venues across the north ranging from village halls and stately homes to St James' Park and Kingston Park Rugby Ground. Simon currently plays with The Mile Roses alongside Kate Bramley and Edwina Hayes, having recently released their debut album.